For the first time, rain fell on the loyal supporters who turned out on the darkest of dark mid-winter nights. Umbrellas to the fore in pictures on the next page but there was good cheer inside and out! The rain continued to fall during the brief unveiling ceremony…..
….but all was warmth and comfort within…..
…..and a warm welcome from our host, second left. 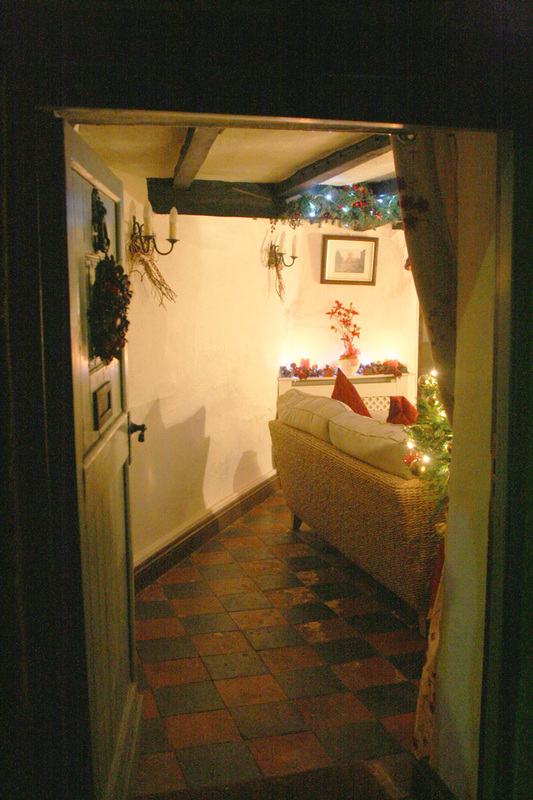 This door to Bell Cottage was once the front door to the Six Bells Inn. Hidden behind this door is another door to the left which led into the pub games room, with Northamptonshire skittles table, bar billiards and darts. Leading in from this front door was a narrow, dark, winding passageway which had two “snugs” off it, each with its own open fireplace. The passageway ended in a tap room where customers went to buy their beer or cider (there being little else) unless they could persuade the landlord to bring it to them. Tonight was the first time I have seen behind this door for more than fifty years but, unless I am very much mistaken, the red and black tiles are just as the were when I last saw them! The right hand wall of the passageway was simply thin matchboard, erected across the tiles. 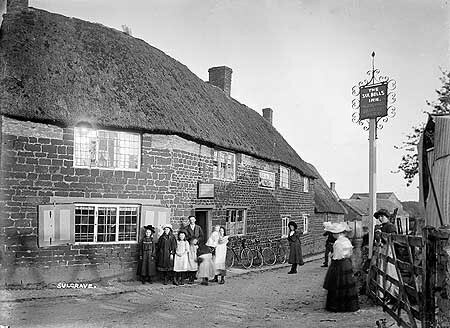 Although the “snugs” were small, the pub had a large first floor function room, with a creaking floor which today would certainly be condemned as unsafe. In the 1940s and 1950s, this room was occasionally used for wedding receptions and sports club dances, the only alternative being the hire of the school (at that time the present Church Hall was the vicar’s billiard room!) A memorable wedding reception was that of Sandy and Kathleen Munro in 1945 (scan down in “More Villagers“). In the days when the main village roads were called simply “Great Street” and “Little Street”, with equal economy of epithet the two village pubs were called “the Top” (Six Bells) and “the Bottom” (The Star). Each had its devotees, who seldom went to the other. From about 1960 onwards, use of the Six Bells declined rapidly and it closed within a couple of years. Customarily, myself and two other members of the village football club committee met at the Six Bells on Sunday lunchtimes to review the previous day’s match and pick the team for the following week. On my last ever visit to the pub there were simply no other customers and it took an age for the landlord to appear and reluctantly draw us three pints of flat beer. The team captain looked at his glass in disbelief. There was a perfect spider’s web across it, except where the tap had penetrated temporarily. We transferred our meetings to the Star! This entry was posted on Sunday, December 11th, 2016 at 10:20 am	and is filed under News. You can follow any responses to this entry through the RSS 2.0 feed. You can leave a response, or trackback from your own site. Oh my word RAIN! it has been so dry and here in Switzerland as well. But Sulgrave is made of stern stuff so it’s great to see another good turnout for the opening of another lovely window.